James Spann has the latest on Hurricane Florence and any possible effect on Alabama from Alabama NewsCenter on Vimeo. A FEW SHOWERS: We will maintain the chance of a few widely scattered showers and thunderstorms across Alabama this afternoon and this evening. Otherwise, today will feature a mix of sun and clouds with a high in the mid to upper 80s. Our weather trends hotter and drier tomorrow through the weekend as we get in the zone of the sinking air around the periphery of Hurricane Florence. The chance of any one spot getting wet is 20-30 percent tomorrow, dropping to 10-20 percent Friday through Sunday. Look for partly to mostly sunny days, fair nights and highs around 90 degrees. 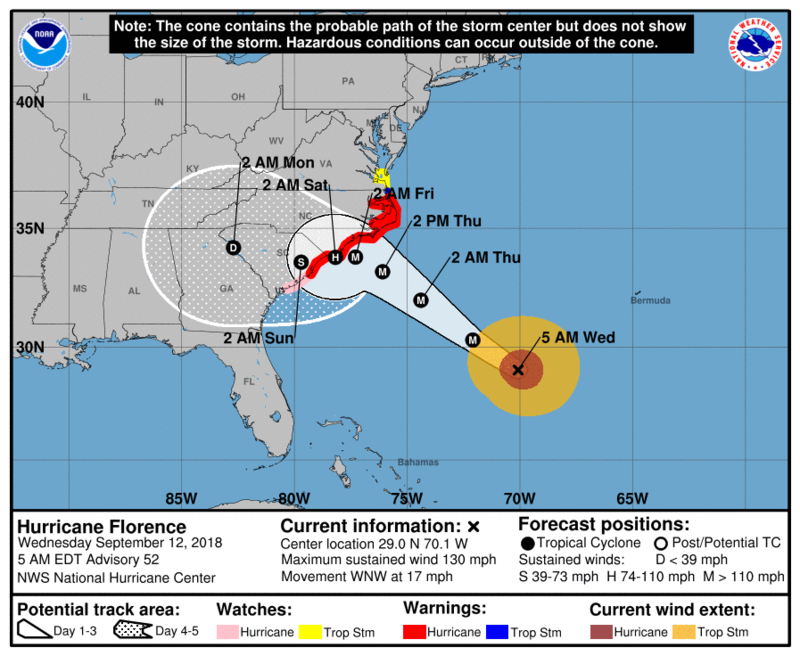 FLORENCE: Hurricane Florence is packing sustained winds of 130 mph, and will be approaching the coast of the Carolinas late tomorrow night into Friday morning. There is great uncertainty beyond 48 hours as the steering currents collapse. Most of the global models now suggest Florence will stall, and drift southwest down the South Carolina coast, possibly even reaching the Georgia coast over the weekend before turning inland. The National Hurricane Center has adjusted its forecast track southward and says more southward adjustments will likely be needed later today. Because of the slow motion of the system, extremely heavy rain is likely over parts of the Carolinas, with a high risk of serious freshwater flooding. A life-threatening storm surge is now highly likely along portions of the coastlines of South Carolina and North Carolina, and a Storm Surge Warning is in effect for a portion of this area. All interests from South Carolina into the mid-Atlantic region should complete preparations and follow any advice given by local officials. Life-threatening, catastrophic flash flooding and significant river flooding is likely over portions of the Carolinas and Mid-Atlantic states from late this week into early next week, since Florence is expected to slow down as it approaches the coast and moves inland. ANY IMPACT ON ALABAMA? 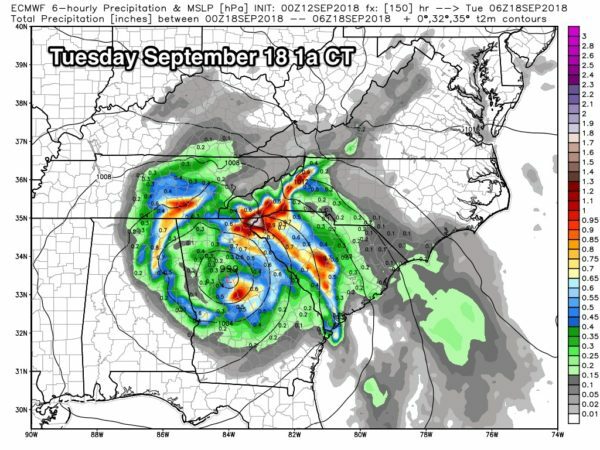 The European global model shows a track through Georgia Sunday and Monday; even with that scenario Alabama would stay on the drier, west side of the circulation, but it could be close enough for some rain over the eastern counties of the state early next week. But again, uncertainty is very high, and there is a chance East Alabama will see little rain. The chance of rain as a direct result of Florence for the western and southern counties of the state is very low. ISAAC: This tropical storm is expected to pass through the Leeward Islands tomorrow and into the Caribbean Friday. The good news is that shear will take a big toll, and the NHC is now forecasting Isaac to dissipate across the Caribbean by Sunday with no impact on the Gulf of Mexico. HELENE: The hurricane in the far eastern Atlantic is moving north, and is no threat to land. INVEST 95L: A tropical wave in the southern Gulf of Mexico could become a tropical depression over the next 24 hours; it is headed for the Texas coast with potential for heavy rain. This will have no impact on Alabama or the central Gulf Coast.